The current property market is highly unaffordable for the majority of young couples and first-time buyers, as house prices continue to soar and new housing developments slow. The UK finds itself in the middle of the worst housing shortage in years. One that is predicted to only continue for years to come as the population outgrows housing supply with a rise of 10 million predicted by 2040. So what can people do when their search for a home leaves them lost? They could continue to pay astronomical rents on par or more expensive than the average mortgage, or, those brave enough, amongst us might take the plunge and build their own house. A growing trend for couples is to bypass the inaccessible property market and construct a home of their own. BBC series “The House That 100K Built” peers into the lives of those courageous couples who have done exactly that. Think Grand Designs on a budget, with an innovative spin on using and sourcing materials. The show follows the amateur house-builders through their journeys, giving an insight into the self-build process. But it isn’t exactly a how-to guide in its self, so some viewers may be thinking “how do I go about starting a project like this?” Luckily for you, this blog provides a step-by-step guide on the self-build process. Ready to get started? Step 1 – Consult your finances and calculate your budget. This is key before starting any big project and will feed into every aspect of your build. It will tell you what you can afford so you can plan accordingly. Sticking to the budget is the hard task. Apply for a self-build mortgage. These types of mortgages are unlike normal home loans, they are usually released in arrears as stages of the build are completed instead of a lump sum at the start. Step 2 – Decide your type of project. There are five broad categories of self-build projects available, ranging from the complete control of a one-off self-build project to low involvement kit homes. Step 3 – Find a plot of land in the area you want to live. One couple in the show lived on acres of farmland in rural Devon and were lucky enough to own the land they wanted to build on to start with. Then buy your plot of land. Step 4 – Design the building you wish to construct. Like most people starting a self-build, you’re not an architect. 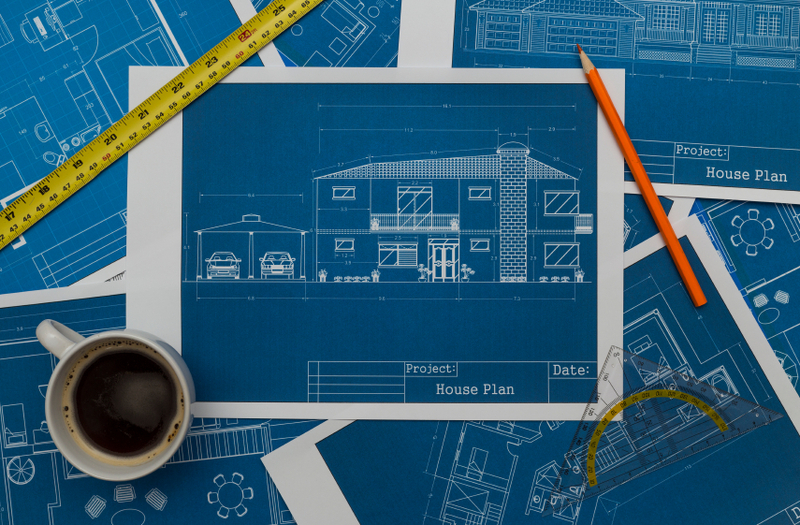 The whole idea of building your own home is that you try to do as much of the project yourself, however, things like building plans are always best to consult a professional on, even if you go on to acquire the skills to draw up your own construction blueprints. You need to create a design brief for the architect, this is a central document that evolves with the build and is your ‘wishlist’ of priorities such as number of bedrooms, space, lighting and many other options. Step 5 – Hire an architect. As with houses being such a common part of life, a lot of people believe they know precisely what their dream home would look like. Architects provide a new perspective on design says, presenter and architect, Piers Taylor “because if we only ever built what we knew then the world would be a very dull place.” An architect is much more than an executor of a plan, they are there to provide inventive solutions to people’s problems. Step 6 – Submit a planning application to your local council. To ensure success, you should consider your location. Local councils like to protect the open countryside from development and policy planners devise a ‘development boundary’ which if you are outside of will struggle to gain permission. Government targets for decisions over planning permission, generally speaking, average eight weeks. Step 7 – Cover yourself and get insurance. Any project like this comes with risks, that’s why you must insure yourself with the right policy in case things fall through. Step 8 – Prepare your plot. Once you’ve bought your land, in most cases the ground is not ready to build on. Therefore, you must make sure it is clean and levelled ready for foundations, before beginning any stages of the construction. Step 9 – Start construction. Finally, after 8 previous steps you are ready to begin creating your dream home. You didn’t think it would be easy did you? Construction should be planned to a timeline, as when you are building your own house you have to be disciplined to stick to a schedule or your build may never complete. Step 10 – Source building supplies. In “The House That 100K Built”, self-builders used a variety of imaginative materials in their projects from reclaimed objects to off cuts and other cheaper alternatives. Piers even suggested using second-hand tractor seats as kitchen stalls in one episode. Step 11 – Reclaim your VAT.